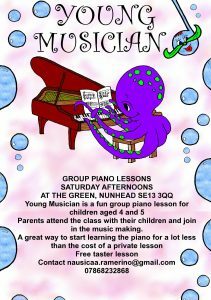 The ​Young Musician Course​ is specially designed as a great introduction to piano playing for children aged 4 and 5. Children will learn music in a fun and enthusiastic environment, as if it was a new language. Different activities are planned during the lesson (weekly – 55 min): singing, listening and rhythm activities, coordination games, memory singing and concentration games. Parents attend the class with their children, helping and joining in in the activities. What a great start to their musical journey, together and in a fun and professional way!